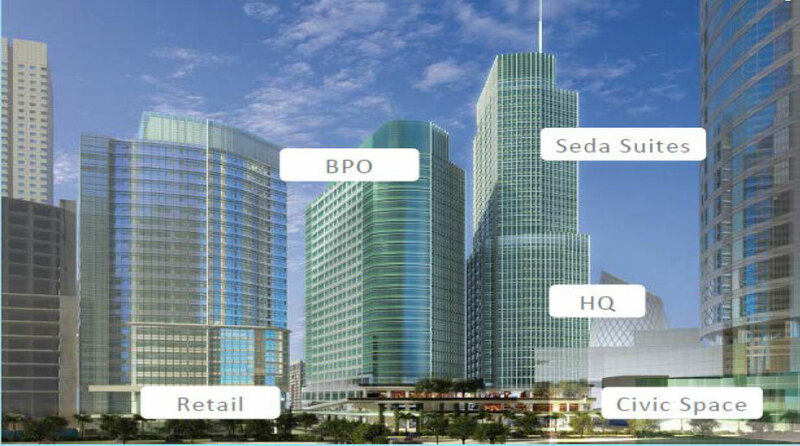 Soon to rise in the Makati Central Business District is a two-tower office facility with a combined Gross Leasable Area of approximately 56,000 square meters. These office towers are specially designed for both Multi-National and Business Process Outsourcing companies. As a supplement to the mixed-use development, office personnel can enjoy the convenience of having a retail podium with 10,000 square meters of restaurants and shopping spaces. The development will also feature a 312-room Seda Hotel. City Gate’s prime location makes it highly accessible to major thoroughfares such as Ayala Avenue and Sen.
Gil Puyat Avenue. Elevated walkways will also connect City Gate to Ayala Center and to the rest of the CBD — great for those who choose to walk and enjoy the real city life. The City Gate at Makati CBD is an upcoming 3-block, business and lifestyle district. An integral part of Makati City`s P125B Redevelopment Plan. The District will be home to the next Ayala Land headquarters and on top of it, Seda Suites Hotel, Corporate Offices for lease, the much-anticipated City Gate Mall, and most importantly, this highly-coveted Office Development, transforming the northern region of Makati CBD into a Creative District! Built in the Ayala Land heritage and through collaboration with top consultants, namely: Sy2 and Associates and Magnusson Klemencic Associates. Based on initial plans, this Office Development will offer Office Units with sizes starting from 100 square meters and more.